With the new edition of this proven bestseller, Photoshop users can master the power of Photoshop CS5 with internationally renowned photographer and Photoshop hall-of-famer Martin Evening by their side. In this acclaimed reference work, Martin covers everything from the core aspects of working in Photoshop to advanced techniques for professional results. Subjects covered include organizing a digital workflow, improving creativity, output, automating Photoshop, and using Camera RAW. The style of the book is extremely clear, with real examples, diagrams, illustrations, and step-by-step explanations supporting the text throughout. 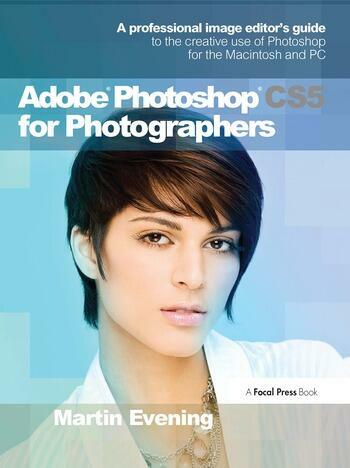 This is, quite simply, the essential reference for photographers of all levels using Photoshop. for kindle and eBook readers. Martin Evening is a professional photographer and digital imaging consultant, an experienced Photoshop user and key demo artist for Adobe. Based in London, UK, Martin was inducted into the legendary Photoshop Hall of Fame in 2008.